Designed and perfected by the people at Bait Tech to suit modern commercial fishing. F1 Groundbait Mix is packed with ground Xpand expander pellets and pure fishmeals with an added sweet edge which makes this the ultimate commercial fishery mix. 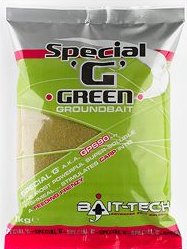 Attractive to all species particularly F1s, Carp and Bream this award winning mix offers attraction and feed triggers in abundance. Turn a good peg in to a flyer!